Based on a novel dataset, the “German Management and Organizational Practices” (GMOP) Survey, we calculate establishment specific management scores following Bloom and van Reenen as indicators of management quality. We find substantial heterogeneity in management practices across establishments in Germany, with small firms having lower scores than large firms on average. 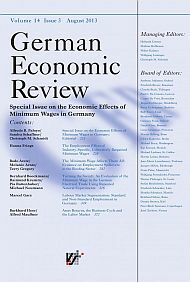 We show a robust positive and economically important association between the management score and establishment level productivity in Germany. This association increases with firm size. Comparison to a similar survey in the US indicates that the average management score is lower in Germany than in the US. Overall, our results point towards lower management quality being at least in part to blame for the differences in aggregate productivity between Germany and the US.